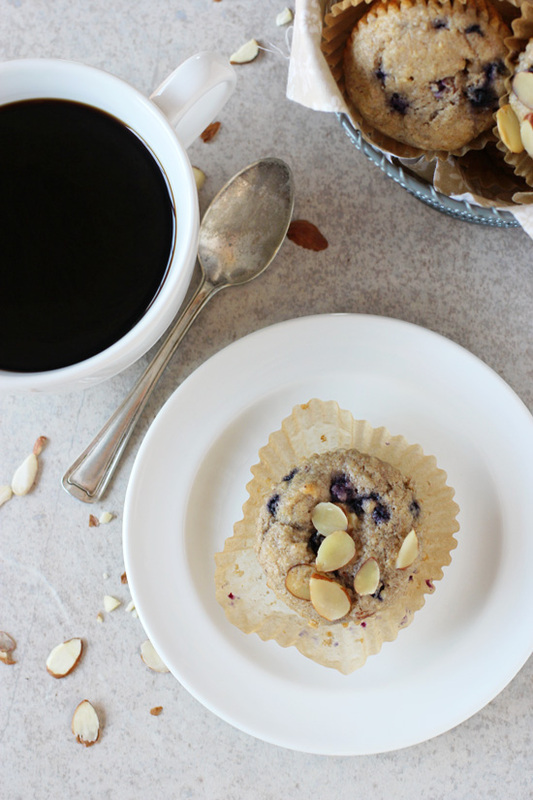 Let’s all close our eyes and pretend that it’s Saturday morning and we’re cozy on the couch with a steaming mug of coffee and one of these blueberry almond whole grain muffins. Except more than likely you’re running around getting ready for work or already at work. Is it Friday yet? Hello weekend. I can see you. You’re so close. Until then I’ll just pull one of these muffins out of my freezer and eat it way too quickly at my desk. And make a giant mess since I try to multitask to the max and get distracted and end up with crumbs on the floor and a hungry beagle swarming around my feet. Really, weekend, can you hurry up and get here? Okay thanks. So let’s talk muffins, yes? This blueberry almond combo (which I ♥ ♥ ♥ – please tell me I’m not the only one who sniffs the bottle of almond extract??) is essentially just a spin on my whole grain morning glory muffins. Wait, I should clarify. 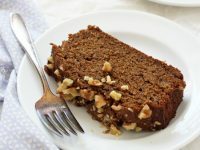 What I mean is that this recipe uses the same perfectly fluffy and moist (yes, I’m using that word) base – which is full of oat bran and white whole wheat flour and sweetened only with honey and maple syrup. To that we add plump awesome blueberries and plenty of sliced almonds. And of course some vanilla and the aforementioned almond extract. Which you must sniff first. Kidding. Maybe. These muffins are not overly sweet – but that’s my style these days. I like to make a batch whenever I have time and then freeze them pretty much immediately after they cool. Except for maybe one muffin which I eat while standing over the muffin tin. Okay, let’s be real. Two muffins. I find that this keeps them perfectly fresh and I can just thaw one out whenever I need it for a quick breakfast or snack. On a related note, I recently stumbled across this post from Julie over at Savvy Eats on the best way to store muffins. I cannot stand it when my homemade muffins get that weird sort of really soft top the day after baking. Anyway, totally trying this out the next time I make some and don’t freeze! Muffins. They make the world go round. No, wait. That’s coffee. Coffee + muffins? 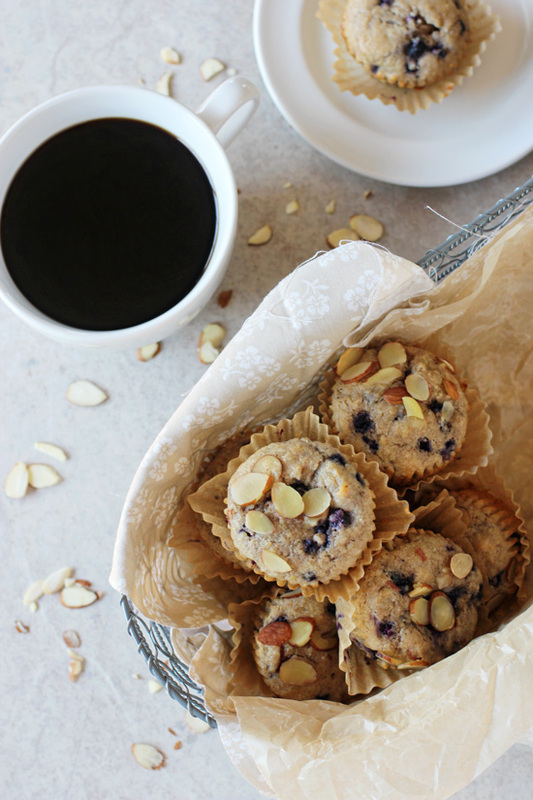 Recipe for blueberry almond whole grain muffins. With whole wheat flour, oat bran and sweetened with honey and maple syrup. Packed with blueberries! Preheat the oven to 375ºF. Line a muffin pan with liners and set aside. Whisk together the white whole wheat flour, oat bran, all-purpose flour, baking powder, salt, cinnamon and nutmeg in a medium bowl. In another medium bowl, whisk together the egg, coconut oil, milk, honey, maple syrup, vanilla extract and almond extract. 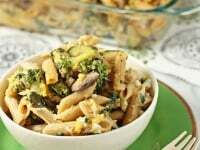 Add to the bowl with the dry ingredients and mix until just combined. Gently fold in the blueberries and almonds. Divide the batter evenly in the prepared muffin tins, filling each about ¾ of the way full. Sprinkle the top of each muffin with additional sliced almonds. Bake for about 15 to 18 minutes, or until a toothpick inserted into the middle comes out clean. Let cool for about 5 minutes, then remove the muffins to a wire rack to cool completely. Be sure to melt the coconut oil first and then measure out the correct amount (otherwise you may use too much). *I’ve also made these muffins several times with frozen blueberries – so they work too! If you do use frozen, they will sort of turn the batter a purple color (which doesn’t bother me but you can use fresh to avoid that!). For the muffins in the pictures I used frozen wild blueberries. If you use fresh, they will be much more golden in color. Pssst. Looking for more breakfast ideas? Check out the smoothie recipe I created for Oh My Veggies! I love almond extract it smells soooooo good 😉 These muffins sound and look great. I would happily curl up on a Saturday morning with a huge mug of coffee and one or two of these. haha you are not the first person to tell me that!! Thanks lady!! This pictures are so pretty Ashley! What a lovely quick start to the weekend! Happy Friday love! Happy Friday! I am so glad that the weekend is here. 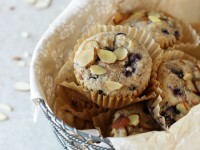 With blueberries in season, I know that I need to make these muffins soon. Love the almond topping! These muffins look so darn pretty! Muffins are the best and the healthier elements here are so good – who needs any form of guilt first thing in the morning. I adore the blueberry and almond combo (pass me the almond extract to sniff!!). Thank you for the storage link…I am so interested in that. My husband loves a muffin for breakfast and I am learning to freeze them and figuring it all out. Thanks Monica! My go-to is definitely the freezing but I really want to try out that other method for when I plan to eat them a little quicker! Wow, these muffins look so delicious! They look so hearty and beautiful and I wish I had one to enjoy with my coffee right now. Yay for the weekend! Have a great one Marcie! I really wish I had a couple of these to go with my coffee right now! You totally took me back to Saturday with that little blurb and these muffins, Ashley! Love it! I bought fresh blueberries locally which was a treat. When I’d told them I’d come to buy them because I saw the sign out front, they were so excited – they’d just put it out that day – and I was glad I’d chosen to make a blueberry baked good. 🙂 Thanks for sharing the recipe!! Love it! Oh I’m so glad that you enjoyed them Am!! Thanks so much for letting me know! I am so wishing it’s the weekend right now too! A batch of these muffins would be the perfect way to get us through. They look so so pretty! 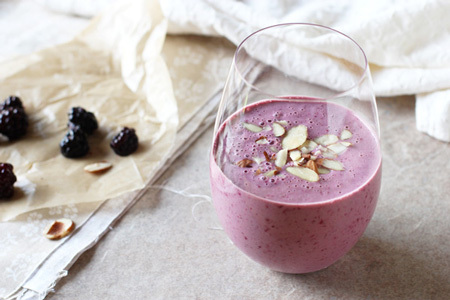 Love the blueberry and almond combo! Seriously, I adore the texture and flavor combo of blueberries and almonds – so I so adore these! Oh I totally agree. 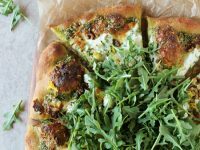 I’ve tried these with more whole wheat flour and they don’t come out as good – but as long as I use the amount listed I don’t have that problem!! Ashley these muffins look amazing! I love almond and blueberry combo too. I think I could eat 3-4 in one sitting. Not good huh? I love me some muffins. 😉 Pinning! haha it happens 🙂 I speak from experience! muffins make my world go round. 🙂 and that’s an interesting tip about muffin storage. 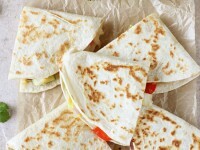 usually i freeze most of them right away in baggies to make lunch packing easy but i’ll have to try that tip next time! I usually freeze too but I’m excited to try that tip as well! Haha, coffee definitely does make the world go round! I’m drinking a cup as we speak, or should I say type? lol These muffins looks so delicious! 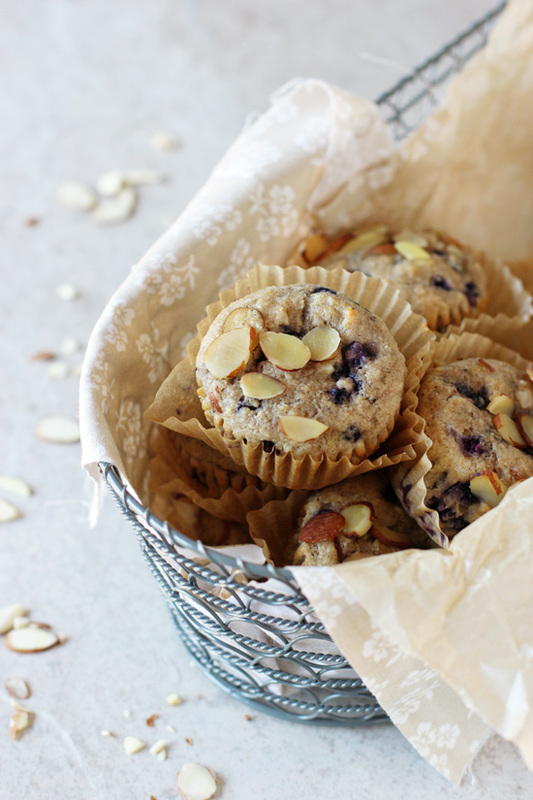 I love blueberry muffins and the addition of almonds just makes them all the more delicious! I’m such a sucker for sliced almonds on top of baked goods! Crumbs all up in my keyboard is the story of my life. Ha! These muffins. Gorgeous. Totally dreaming of the weekend now too! Blueberry muffins are my absolute favorite type of muffin! And with the combination of almonds, they sound just perfect! Muffin + coffee totally make the world go round! These beauties have just GOTTA happen this weekend! 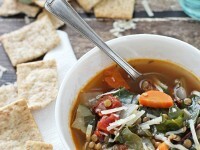 Love all the whole grains you packed into them which totally means I can eat more, right?! Yes to everything! Yes to wishing it was Saturday morning, yes to sniffing the almond extract, and a big YES to these muffins! They look like just my kind of breakfast! haha I’m so glad I’m not the only one who sniffs it!! These muffins look amazing, Ashley! I love the sliced almonds on top! What a perfect breakfast or snack, especially since they’re on the healthy side! Okay, you’re getting me to buy some whole grain flour, I guess it’s time! And since I absolutely have to go grocery shopping today as there’s nothing to eat in the house. Muffins with blueberries in them are my favorite way to go in a muffin, I can just see my kids gobbling these down in their car seats when we go on a mission. Crumbs, bah! It’s worth it if they’re not whining! haha it’s a perfect day to buy it then!! Me too – blueberries are so classic but so good! I am big time yearning for the weekend. And a cup of coffee with these muffins sounds perfect!